Created for the WAG Challenge game jam. You awaken from the crash in a strange place. You seem to have lost track of yourself. 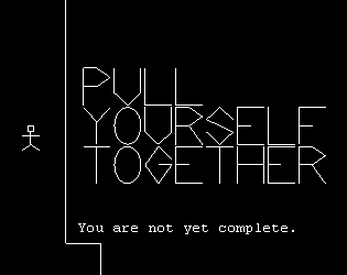 Pull Yourself Together is a visually-unique adventure game that imitates the graphics of old-school vector games. Explore this strange world and take on its challenges to gather pieces of yourself and seek a way back home. There's more pieces out there than you have room for, so which ones will you make yourself out of? Made with the help of Moonlight Neo to be short, sweet, and free of charge. Playable in twenty minutes, though has no save feature, sorry. UPDATE: Now has some background music! Courtesy of NoSoapRadio.us.